How do I start inviting friends to join my league? Each league has a unique link which you can share with friends. 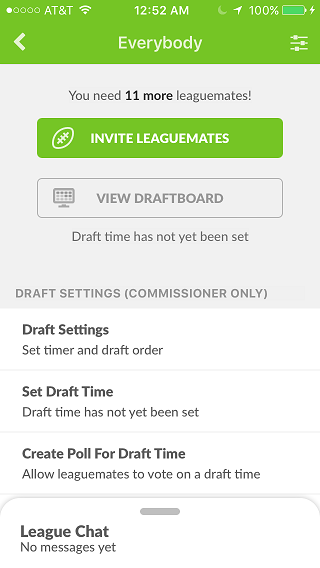 Your league's custom invite URL can be accessed either on web or mobile via your league home-page, and also in the league settings. You can share this link with your friends through whichever means most convenient (i.e., email, text, social media), and the recipient of the link will automatically get dropped into the league! Magic Link: We give you magic links that work even if your friend does not have the app. If your friend clicks the link and installs Sleeper, they will be automatically dropped into your league upon sign up. Your friends will no longer need to search for a league ID, or jump through any other hurdles...anyone that you give the link to will automatically be taken to your league, whether they come in from web or mobile. To make the commissioner's life easier, your leaguemates can also share the link with their friends as well, helping to facilitate the invite process. Commissioners will no longer have to play middle-man to invite friends-of-friends into a league. We can also remind your friends to join if you input their contact information via contacts sync so you don’t have to think about it. The web and mobile invite links are the same.